The 2016 Nissan Maxima puts an entirely new spin on the classic sedan design. 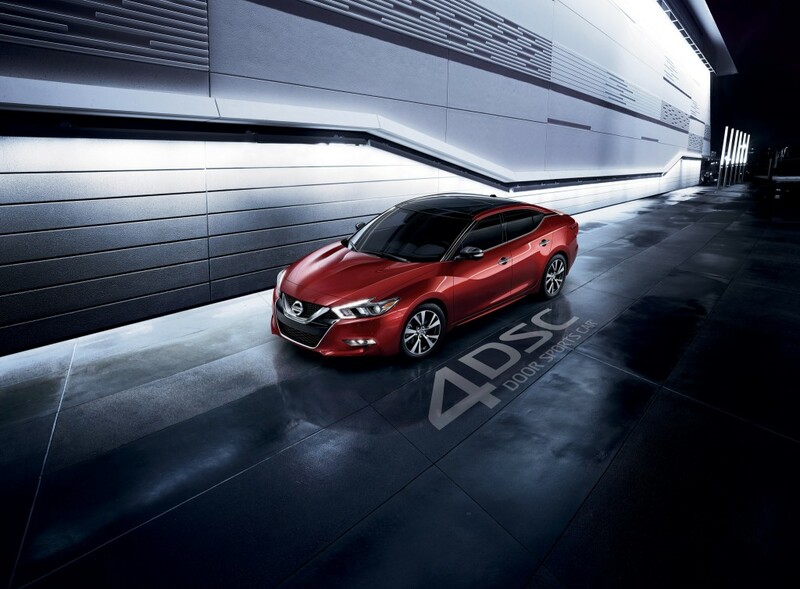 Packing more performance into an all-new style, the Maxima is truly a four door sports car. 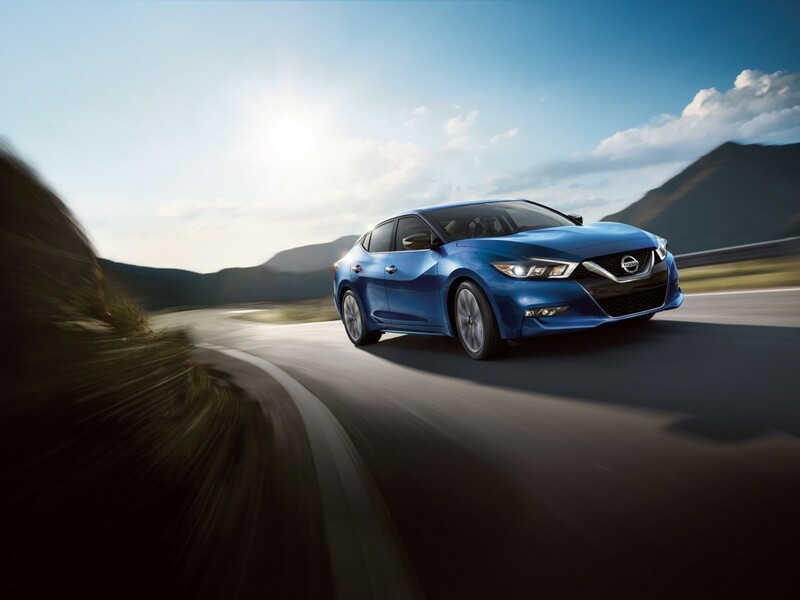 The 2016 Nissan Maxima offers a unique driving experience you’ll never forget! The 2016 Nissan Maxima runs on a powerful 3.5L DOHC 24-valve V6 engine that achieves amazing fuel efficiency. This 4-door sports car can achieve up to 30 mpg highway and 22 mpg city**. Operating on an Xtronic® continuously variable transmission with D-step logic, the 2016 Maxima generates 300 horsepower and 261 lb-ft of torque. Do not underestimate this sedan – it is racetrack ready! The 2016 Maxima has amazing standard exterior features including: LED daytime running lights, Fog lamps, Halogen headlamps, and Dual mufflers with rolled chrome-tipped finishers. If you want more convenient exterior features, take a look at some of the higher, more advanced trim levels where you can find more exterior features including: Heated side mirrors with LED turn signal indicators, Vehicle speed-sensing variable intermittent wipers, Dual panel panoramic moonroof, 19-inch “Diamond Cut” wheels, LED low-beam headlights, Rear-window power sunshade, , LED low-beam headlights, Side mirrors with reverse tilt-down feature, Auto-dimming driver-side side mirror, and/or Rain-sensing wipers. Make your life a little easier and driving a little safer with the exceptional features found on the 2016 Nissan Maxima! 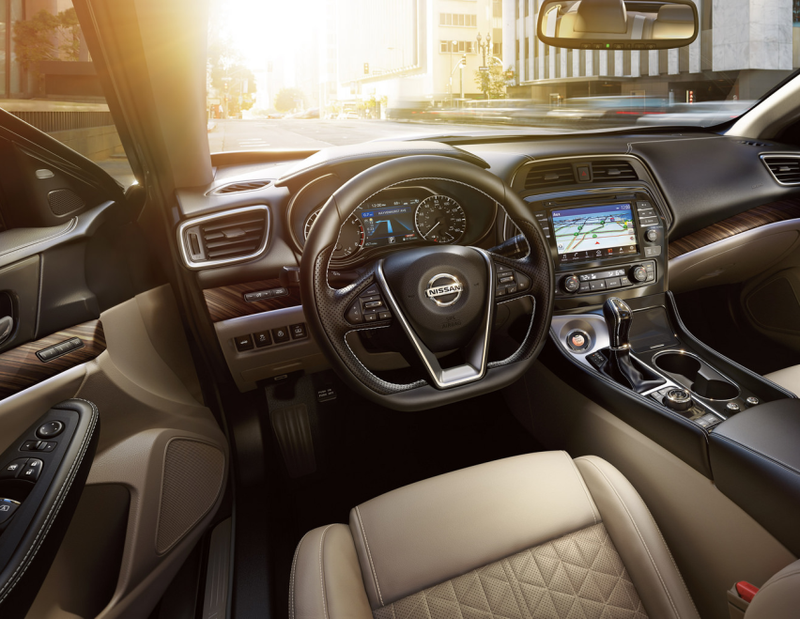 The 2016 Nissan Maxima has a quality interior to keep you comfortable! The 2016 Nissan Maxima comes standard with comfortable interior features including: 60/40 split fold-down rear seatbacks, Dual zone automatic temperature control with in-cabin filter, Leather-wrapped steering wheel and shift knob, Eight-way power driver’s seat, Two 12-volt power outlets, and Razor steel trim. Stay entertained with standard radio and technology features including: Hands-free text messaging assistant, HD Radio, Bluetooth®, SiriusXM® Traffic and Travel, AM/FM with eight speakers, NissanConnectSM™ Navigation, and Advanced Drive Assist® with 7.0-inch color display. On higher trim levels you can find interior features such as: Leather-appointed seating, Heated front seats with power lumbar and thigh support, Heated steering wheel, Adjustable ambient LED interior lighting, Sports pedals, Liquid chrome trim, Premium Ascot leather-appointed seats with Diamond-quilted Alcantara® inserts, Climate-controlled front seats, Ascot leather-wrapped steering wheel, Premium Ascot leather-appointed seats with Diamond-quilted Alcantara® inserts, Mahogany wood-tone trim, Climate-controlled front seats, Power-tilt/telescoping steering column, and/or Memory System for driver’s seat and mirrors. On these higher trim levels, the radio and technology get bigger and better too! Sit back and enjoy the following features on your new 2016 Nissan Maxima: Front and rear parking sensors, Active Noise Cancellation, Predictive Forward Collision Warning, Intelligent Cruise Control, Blind Spot Warning, Bose® Premium Audio, Forward Emergency Braking, Active Sound Enhancement, Rear Cross Traffic Alert, Integrated Dynamic-control module, Front chassis damper, Sport-tuned suspension, Moving Object Detection, NissanConnectSM™ services with SiriusXM, AroundView® monitor, and/or Driver Attention Alert. Some of the standard safety features on the 2016 Nissan Maxima include: Advanced air bag system with supplemental front air bags and occupant-classification sensors, Driver and front-passenger side-impact air bags and curtain airbags, Vehicle Dynamic Control with Traction Control System, Zone body construction with front and rear crumple zones, Energy-absorbing steering column, Tire pressure monitoring system with Easy-Fill Tire Alert, and Vehicle immobilizer system with security system. Both a high-performance sports car and a sophisticated, comfortable ride, the 2016 Maxima is the sedan for you. Designed to add more kick to the daily commute, this car brings performance, handling, and fuel economy into one vehicle. Not convinced? Stop in and check out the new design that will turn heads as you roll down the street! ** Fuel Economy based on Targeted 2016 EPA fuel economy estimates for 2016 Maxima. Estimated based on Nissan internal testing results, subject to EPA confirmation. Actual mileage may vary with driving conditions.